"I enjoy altering forms to create unique one of a kind trophy for you to have in your home or work place. Taxidermy is an art, and my passion." – Mike Guillotte. Mike Guillotte, owner of Mike's Mount Taxidermy, was born and raised in Grand Bay, Alabama. He received his first gun at age 10, and has hunted and fished religiously ever since. This started what would become a deep love for the outdoors. After graduating High School, Mike attended Alabama Southern Community Collage and received his associate’s degree in Forestry. While working in the Forest Industry, Mike was able to see and study animals in their natural habitat. That sparked his interest in Taxidermy. In 1993, Mike started doing Taxidermy for friends and family. He soon would learn that his 8 years of working in the Forest Industry doing jobs such as; site preparation, tree planting, prescribed burning, and most other areas of land management practices, would give him a huge advantage in doing Taxidermy. Working in the woods and seeing the different species of animals gave him an in-depth knowledge of the way animals move and their facial features. In 1999, after many Taxidermy seminars and classes through Piedmont Community Collage and local Taxidermy shows, Mike decided to go fulltime. Today, Mike runs a full service taxidermy business. He is Vice President of the National Turkey Federation West Mobile Golden Spurs Chapter in Mobile, and is a certified Hunter Safety Course Instructor. View his current classes. 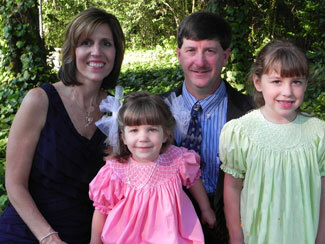 Family: his wife is Susan, oldest daughter is Samantha and youngest daughter is Rachel (shown right). He and his family are active church members.